This document has been the source of much debate in recent months. It has given us both clues and red herrings. The original document is not the easiest to read and between us we have created a more legible version. 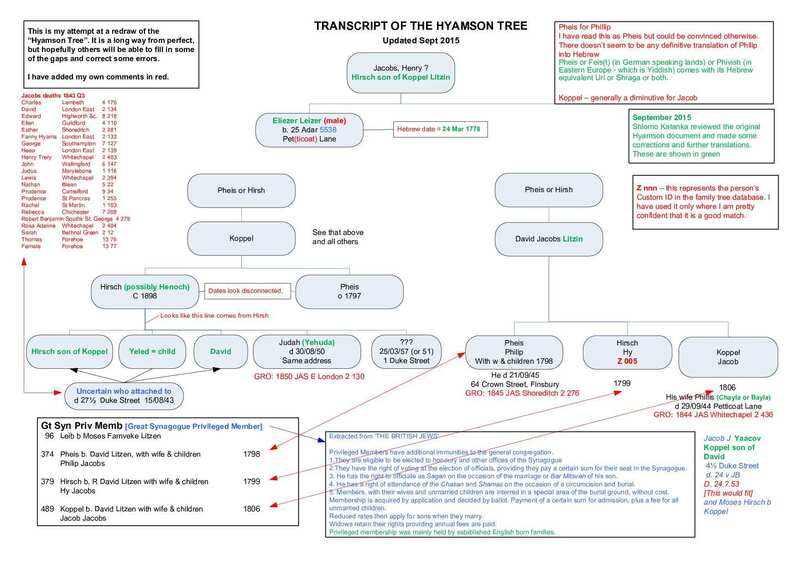 The Hyamson Collection is a collection of Anglo-Jewish genealogies compiled by A M Hyamson. There are several copies in existance, all on microfilm. The most accessible copy is probably the one at the Society of Genealogists. 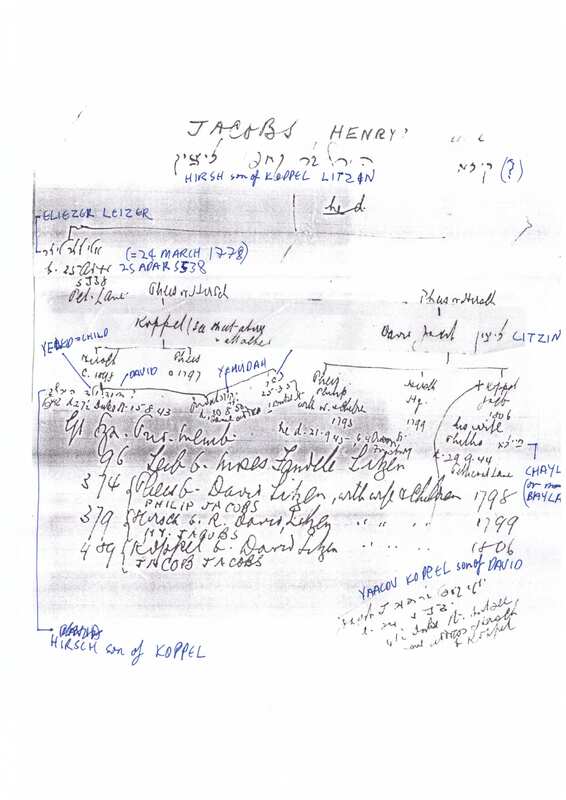 Hyamson compiled his notes from various sources and it must be pointed out that they appear not to have been subjected to too thorough a checking – but this was probably not his intent. Rather he wanted to record as much information as possible. I believe that he also got some of his information by asking people, which is, as we all know, subject to mis-remembrances. The handwriting leaves a lot to be desired (good job I wasn’t writng them) and there is a mixture of English and Hebrew. This said, it is a very worthwhile set of documents and I believe that any inaccuracies are probably outweighed by the valid content – who is to say that our trees are perfect? 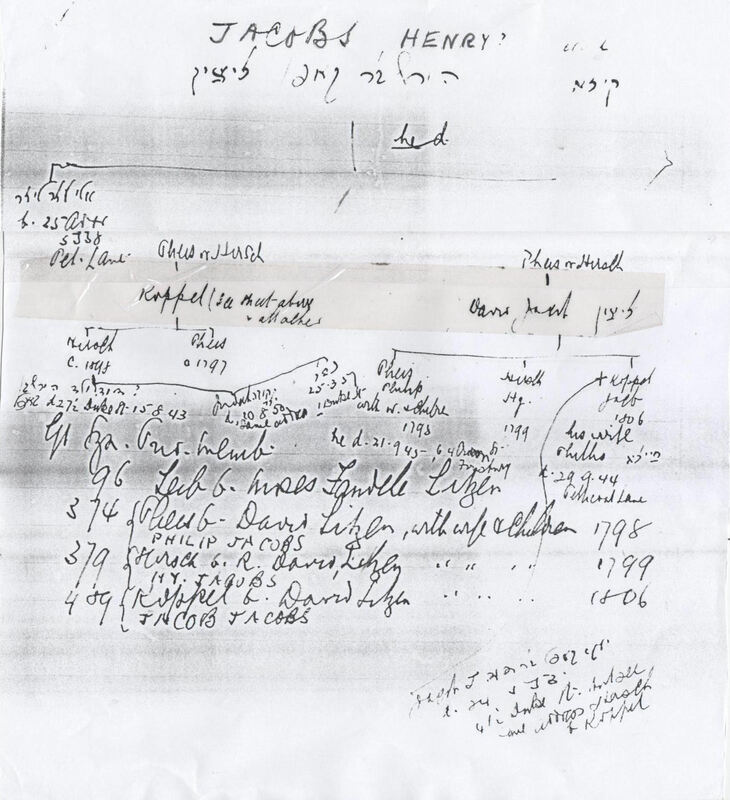 Just to explain more about the various docs above- there are hundreds of family trees/will probate summaries/letters/JC references in the docs- they are organized in Surname order but nothing else. The Collyer Ferguson records are on 8? reels of film and Hyamson is on microfiche- usually 24 pages per fiche. Hyamson is very difficult to read as you can see but he does have some very important records Collyer doesn’t. It is very time consuming wading through all the docs which is why you need 2+ people helping. Some of the records contain the original family names from Germany /holland etc so you can see early origins- its very much pot luck. Now we are getting into the hard part- what records exist overseas of our Litzen line and what language are they in? That is going to prove tough for us!